The PROV Ontology (PROV-O) expresses the PROV Data Model using the OWL2 Web Ontology Language (OWL2). It provides a set of classes, properties, and restrictions that can be used to represent and interchange provenance information generated in different systems and under different contexts. It can also be specialized to create new classes and properties to model provenance information specific to different domain applications. PROV-XML, an XML schema for the PROV data model. The Linked Data and Semantic Web community should focus on PROV-O defining PROV classes and properties specified in an OWL-RL ontology. For further details, PROV-DM and PROV-CONSTRAINTS specify the constraints applicable to the data model, and its interpretation. PROV-SEM provides a mathematical semantics. The XML community should focus on PROV-XML defining an XML schema for PROV. Further details can also be found in PROV-DM, PROV-CONSTRAINTS, and PROV-SEM. Readers seeking to implement other PROV serializations should focus on PROV-DM and PROV-CONSTRAINTS. PROV-O, PROV-N, PROV-XML offer examples of mapping to RDF, text, and XML, respectively. This specification defines the PROV Ontology as the normative representation of the PROV Data Model using the Web Ontology Language (OWL2). Following feedback, the structure of the document has been reorganized to suit a gradual introduction to the terms available in PROV-O, permitting the addition of more elaborate terms as users understand the earlier terms. A cross reference was added and is created directly from the OWL ontology. Examples throughout this document are taken directly from the working group's version control system. This document was published by the Provenance Working Group as a Working Draft. This document is intended to become a W3C Recommendation. If you wish to make comments regarding this document, please send them to public-prov-wg@w3.org (subscribe, archives). All feedback is welcome. The PROV Ontology (PROV-O) defines the normative OWL2 Web Ontology Language encoding of the PROV Data Model [ PROV-DM ]. This document describes the set of classes, properties, and restrictions that constitute the PROV Ontology. This ontology specification provides the foundation to implement provenance applications in different domains that can represent, exchange, and integrate provenance information generated in different systems and under different contexts. Together with the PROV Access and Query [ PROV-PAQ ] and PROV Data Model [ PROV-DM ], this document forms a framework for provenance information interchange and management in domain-specific Web-based applications. PROV-O conforms to the OWL-RL profile and is lightweight so that it can be adopted in the widest range of applications. The PROV Ontology classes and properties are defined such that they can not only be used directly to represent provenance information, but also can be specialized for modeling application-specific provenance details in a variety of domains. Thus, the PROV Ontology is expected to be both directly usable in applications as well as serve as a reference model for creating domain-specific provenance ontologies and thereby facilitate interoperable provenance modeling. To demonstrate the use of PROV-O classes and properties, this document uses an example provenance scenario similar to the one introduced in the PROV-Primer [ PROV-PRIMER ]. PROV-O conforms to the OWL-RL profile and is lightweight so that it can be adopted in the widest range of applications. The PROV Data Model [ PROV-DM ] introduces a minimal set of concepts to represent provenance information in a variety of application domains. This document maps the PROV Data Model to PROV Ontology using the OWL2 ontology language, which facilitates a fixed interpretation and use of the PROV Data Model concepts based on the formal semantics of OWL2 [ OWL2-RDF-BASED-SEMANTICS ]. We briefly introduce some of the OWL2 modeling terms that will be used to describe the PROV Ontology. An OWL2 instance is an individual object in a domain of discourse, for example a person named Alice or a car, and a set of individuals sharing a set of additional characteristics is called a class. Person and Car are examples of classes representing the set of individual persons and cars respectively. The OWL2 object properties are used to link individuals, classes, or create a property hierarchy. For example, the object property "hasOwner" can be used to link car with person. The OWL2 datatype properties are used to link individuals or classes to data values, including XML Schema datatypes [ XMLSCHEMA-2 ]. PROV-O users may only need to use parts of the entire ontology, depending on their needs and according to how much detail they want to include in their provenance information. For this, the PROV-O terms (classes and properties) are grouped into four categories to provide an incremental introduction to the ontology: Starting Point terms, Expanded terms, terms for Qualifying relationships, and terms for Collections. Collection classes and properties are specializations of the Starting Point and Qualified terms that describe the provenance of collections as key-value pairs that are inserted and removed to create new collections. The classes and properties in this category are listed below and are discussed in Section 3.4.
prov:Entity: An entity is a thing one wants to provide provenance for. Things can be physical, digital, conceptual, or otherwise. prov:Activity: An activity is something that occurs over a period of time and acts upon or with entities. This action can take multiple forms: consuming, processing, transforming, modifying, relocating, using, generating, etc. prov:Agent: An agent bears some form of responsibility for an activity taking place. Further, an agent may act on behalf of another agent when involved with an activity. These three classes and the properties that relate them are illustrated in the following figure. Entities are related to each other using derivation, which is used to specify that the creation/existence of an entity was influenced in some way by the consumption of another entity. An entity can be attributed to an agent to specify that the entity was generated by some activity that the agent in question was associated with. Activities may depend on each other. PROV-O distinguishes between two kinds of dependencies which are specified using the properties prov:wasInformedBy and prov:wasStartedByActivity. The first is used to specify that an activity used an entity that was generated by another activity, and the second is used to specify that an activity was started or triggered by another activity. The following PROV-O describes the resources involved when creating a chart about crime statistics. The example uses only Starting Point terms and serves as a basis for elaboration that will be described in subsequent sections. In the example, Derek performs an aggregation of some government crime data, grouping by national regions that are described in a separate dataset by a civil action group. ex:government         a prov:Organization, foaf:Organization . ex:civil_action_group a prov:Organization, foaf:Organization . Finally, the example states that the agent ex:derek acted on behalf of the organization ex:chartgen. This section defines additional terms for describing provenance at a greater level of specificity in Agents (i.e., prov:Person or prov:SoftwareAgent and prov:Organization) and entities (prov:specializationOf and prov:AlternateOf). Additionally, some of these terms provide the means to assert extended details about the concepts introduced in section 3.1 (prov:wasStartedBy and (prov:wasEndedBy in activities and prov:Location in entities). Further annotations on provenance records can be done through prov:Notes, although we can group the provenance statements in prov:Accounts in order to keep the record of the provenance metadata itself. The new terms in this section also facilitate the modeling of common provenance assertions related to web resources. For example, different versions of a web page can be represented using the prov:wasRevisionOf property, the prov:hadOriginalSource property can be used to reference the original source of information used in a web resource and users can quote existent entities using the prov:wasQuotedFrom property. For expressing the dependency between two different entities, users can assert the prov:tracedTo property. We illustrate below the use of the expanded terms using the crime file example from the previous section as reference. Agent Derek now publishes a post about his work with the aggregated file, while Monica publishes an alternate version to reach a more casual audience. prov:tracedTo         ex:aggregatedByRegions;                       ## If the file hadn't existed, Monica would have not written the post. Agent ex:derek, acting again in behalf of the ex:chartgenerators organization, publishes a post about his recent changes to the aggregated file (ex:aggregatedByRegions). He also provides the location for the crime file, so everyone knows the content he has been browsing, and records the city where the publishing took place (Madrid). Since he is the one who started and ended the publishing activity (ex:publicationActivity1123), that information is recorded as well. The post produced by ex:derek (ex:post9821) includes a permanent link where the content of the latest version is shown (ex:more-crime-happens-in-cities) plus a snapshot of the content of the current version (ex:postContent0). Derek also adds additional metadata of the post, like the title. However, inmediately after having published the post, Derek detects a typo. He doesnt' want to record the activity that led to the new version, so he just creates a new version and summarizes the changes in a revision of the original post(ex:post9821v1). This revision is also a specialization of the original post, since it is a refined version. Thus, the location of the new revision has the same permalink, but a different url for its snapshot (ex:postContent1). Shortly after Derek's post publication, ex:monica adapts the text for a wider audience in a new version (ex:post9821v2). This version is an specialization of the original post, and an alternate of the first version modified by Derek. Since the provenance produced by Derek and Monica is related to the same resources, the system automatically groups it in the same prov:Account (ex:accountPost). Agent ex:John also names the URI of the original source (ex:aggregatedByRegions). All the provenance statements related to his post are grouped in a new prov:Account (ex:accountPost2). Finally, a web crawler (ex:boogleParser) parses the second post. The crawler acts in behalf of Boogle, an organization that want to index the posts. It also adds an annotation on the second account (ex:accountPost2), stating at which date the parsing was made. The classes and properties in the Qualified terms category are for users who wish to provide additional details about the relationships between entities, activities, and agents. The terms in this category are the result of applying the Qualification Pattern to the simple relations available in the Starting Point and Expanded categories. For example, Figure 2 illustrates the classes and properties needed to fulfill the qualification pattern for the prov:used and prov:wasAssociatedWith properties. While prov:qualifiedUsage, prov:Usage, and prov:entity are used to qualify prov:used relations, prov:qualifiedAssociation, prov:Association, and prov:agent are used to qualify prov:wasAssociatedWith relations. This pattern applies to the twelve other relations that can be qualified. In the example, the prov:qualifiedUsage property parallels the prov:used property, and references an instance of prov:Usage that provides attributes of the prov:used relation between the Activity and Entity. The prov:entity property is used to cite the Entity that was used by the Activity. 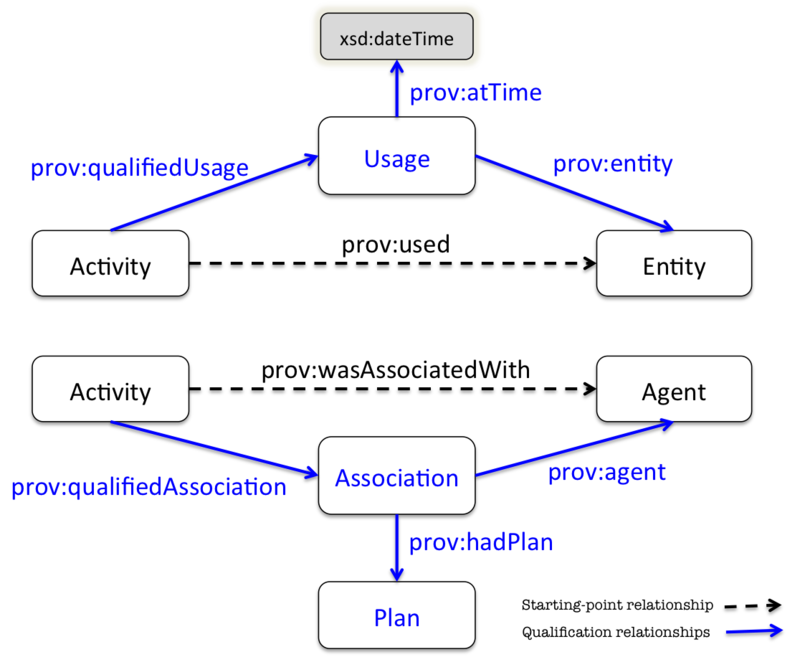 In this case, the time that the Activity used the Entity is provided using the prov:atTime property and a literal xsd:dateTime value. Similarly, the prov:qualifiedAssociation property parallels the prov:wasAssociatedWith property, and references an instance of prov:Association that provides attributes of the prov:wasAssociatedWith relation between the Activity and Agent. The prov:agent property is used to cite the Agent that was involved in the Activity. In this case, the plan that the Agent used is provided using the prov:hadPlan property and an instance of prov:Plan. Figure 2. An illustration of the qualification pattern applied to the Starting Point properties prov:used and prov:wasAssociatedWith. The following two examples show the result of applying the Usage and Association patterns to the chart making example from Section 3.1. The prov:qualifiedAssociation property parallels the prov:wasAssociatedWith property to provide an additional description to ex:illustrationActivity. The instance of prov:Association cites the agent (ex:derek) that followed the instructions (ex:tutorial_blog). ex:tutorial_blog a prov:Plan, prov:Entity . Usage and Association (described above) are accompanied by six other qualifications of Starting Point relations. The following table lists the simple relations that can be qualified, along with the qualification property, qualification class, and the property used to indicate the object of the qualified relation. Qualification Property and Involvement Class used to qualify a Starting-point Property. Six relations from the Expanded category can also be qualified. The following table lists the simple relations that can be qualified, along with the qualification property, qualification class, and the property used to indicate the object of the qualified relation. Qualification Property and Involvement Class used to qualify an Expanded Property. This section finishes with two more examples of qualification as applied to the chart making example from Section 3.1. A prov:Dictionary is an prov:Entity that acts as a container to some members, which are themselves entities. Specifically, a dictionary is composed of set of key-value pairs, where a literal key is used to identify a constituent entity within the dictionary. To illustrate this, the example below describes a dictionary :c1 that has as members the two key value pairs ("k1", :e1) and ("k2", :e2). It is worth noting that :c1 may also have other members (i.e. prov:knownMembership is not functional). A dictionary may be empty and thus not have any known memberships, in which case it should be described as an instance of the subclass prov:EmptyDictionary. To describe the provenance of a dictionary, PROV-O provides two kinds of involvements: prov:qualifiedInsertion is used to describe that a dictionary was obtained from an existing dictionary by inserting a set of key-value pairs. prov:qualifiedRemoval is used to specify that a given dictionary was obtained from an existing dictionary by removing a set of key-value pairs. The example below specifies that the dictionary :c1 was obtained from the empty dictionary :c1 by inserting the key-value pairs ("k1", :e1) and ("k2", :e2). Similarly, the example below specifies that the dictionary :c3 was obtained by removing the key-value pairs associated with the keys "k1" and "k2" from the dictionary :c2. Thus, :c3 does not contain the members ("k1", :e1) and ("k2", :e2( from :c2. An activity is something that occurs over a period of time and acts upon or with entities. This action can take multiple forms: consuming, processing, transforming, modifying, relocating, using, generating, or being associated with entities. Activities that operate on digital entities may for example move, copy, or duplicate them. An agent is a type of entity that bears some form of responsibility for an activity taking place. An entity is a thing one wants to provide provenance for. For the purpose of this specification, things can be physical, digital, conceptual, or otherwise; things may be real or imaginary. The time when an activity ended. The time when an activity started. The start of an activity with an implicit trigger generated by another activity. An account is any mechanism by which a set of provenance descriptions can be bundled up and named. Note that there are kinds of accounts (e.g. handwritten letters, audio recordings, etc.) that are not expressed in PROV-O, but can be still be described by PROV-O. #A Location can be a path or a geographical location. Attribute-value pairs occurring in notes are application specific. # Googlebot is Google's web crawling bot. it can initiate and participate in web-crawling activities. Location is an optional attribute of Entity and Activity. This inverse of prov:wasGeneratedBy is defined so that Activities being described can reference their generated outputs directly without needing to 'stop' and start describing the Entity. This helps 'Activity-centric' modeling as opposed to 'Entity-centric' modeling. An entity is a specialization of another if they both refer to some common thing but the former is a more constrained entity than the former. The common entity does not need to be identified. An object property to link back an entity to another by means of derivation or responsibility relations, possibly repeatedly traversed. An entity is derived from an original entity by copying, or "quoting", some or all of it. rdfs:comment "Ended up with bar chart as line chart looked ugly."@en . prov:ActivityInvolvement provides descriptions of any binary involvement between any instance and an prov:Activity. prov:AgentInvolvement provides descriptions of any binary involvement between any instance and an prov:Agent. :house-styles a prov:Plan, prov:Entity . An instance of prov:Association provides additional descriptions about the binary prov:wasAssociatedWith relation from an prov:Activity to some prov:Agent that is responsible for it. For example, :baking prov:wasAssociatedWith :baker; prov:qualified [ a prov:Association; prov:entity :baker; :foo :bar ]. An instance of prov:Attribution provides additional descriptions about the binary prov:wasAttributedTo relation from an prov:Entity to some prov:Agent that is responsible for it. For example, :cake prov:wasAttributedTo :baker; prov:qualified [ a prov:Attribution; prov:entity :baker; :foo :bar ]. An instance of prov:Communication provides additional descriptions about the binary prov:wasInformedBy relation from an informed prov:Activity to the prov:Activity that informed it. For example, :you_jumping_off_bridge prov:wasInformedBy :everyone_else_jumping_off_bridge; prov:qualifiedCommunication [ a prov:Communication; prov:entity :everyone_else_jumping_off_bridge; :foo :bar ]. An instance of prov:Derivation provides additional descriptions about the binary prov:wasDerivedFrom relation from some prov:Entity to another prov:Entity. For example, :chewed_bubble_gum prov:wasDerivedFrom :unwrapped_bubble_gum; prov:qualified [ a prov:Derivation; prov:entity :unwrapped_bubble_gum; :foo :bar ]. An activity end event is the instantaneous event that marks the instant an activity ends. An instance of prov:End provides additional descriptions about the binary prov:wasEndedBy relation from some ended prov:Activity to an prov:Entity that ended it. For example, :ball_game prov:wasEndedBy :buzzer; prov:qualified [ a prov:Usage; prov:entity :buzzer; :foo :bar; prov:atTime '2012-03-09T08:05:08-05:00'^^xsd:dateTime ]. prov:EntityInvolvement provides descriptions of any binary involvement between any instance and an prov:Entity. An entity generation event is the instantaneous event that marks the final instant of an entity's creation timespan, after which it is no longer available for use. An instance of prov:Generation provides additional descriptions about the binary prov:wasGeneratedBy relation from a generated prov:Entity to the prov:Activity that generated it. For example, :cake prov:wasGeneratedBy :baking; prov:qualifiedGeneration [ a prov:Generation; prov:entity :baking; :foo :bar ]. Invalidation is the start of the destruction, cessation, or expiry of an existing entity by an activity. The entity is no longer available for use after invalidation. Any generation or usage of an entity precedes its invalidation. Any resource that involved an prov:Activity, prov:Entity, or prov:Agent can qualify its involvement by also referencing an instance of prov:Involvement. Instances of prov:Involvement reference the involved Activity, Entity, or Agent (using prov:activity, prov:entity, or prov:agent, respectively) and may be described with any kind of attributes, including user-defined attributes and those provided by PROV (prov:hadRole, prov:hadPlan, prov:atTime, prov:hadLocation). A description (via prov:Involvement) of the binary involvement implies the assertion of the binary involvement. rdfs:comment "Use blue graphs for positive spin, red for negative"@en . A quotation is the repeat of (some or all of) an entity, such as text or image, by someone other than its original author. An instance of prov:Quotation provides additional descriptions about the binary prov:wasQuotedFrom relation from some prov:Entity to another prov:Entity. For example, :here_is_looking_at_you_kid prov:wasQuotedFrom :casablanca_script; prov:qualified [ a prov:Quotation; prov:entity :casablanca_script; :foo :bar ]. Responsibility is the fact that an agent is accountable for the actions of a 'subordinate' agent, in the context of an activity. An instance of prov:Responsibility provides additional descriptions about the binary prov:actedOnBehalfOf relation from a performing prov:Agent to some prov:Agent for whom it was performed. For example, :mixing prov:wasAssociatedWith :toddler . :toddler prov:actedOnBehalfOf :mother; prov:qualified [ a prov:Responsiblity; prov:entity :mother; :foo :bar ]. An instance of prov:Revision provides additional descriptions about the binary prov:wasRevisionOf relation from some prov:Entity to another prov:Entity. For example, :draft_2 prov:wasRevisionOf :draft_1; prov:qualified [ a prov:Source; prov:entity :draft_1; :foo :bar ]. A Role is the function of an entity with respect to an activity, in the context of a usage, generation, association, start, and end. An original source refers to the source material that is closest to the person, information, period, or idea being studied. An instance of prov:Source provides additional descriptions about the binary prov:hadOriginalSource relation from some prov:Entity to another prov:Entity. For example, :blog prov:hadOriginalSource :newsArticle; prov:qualified [ a prov:Source; prov:entity :newsArticle; :foo :bar ]. An activity start event is the instantaneous event that marks the instant an activity starts. An instance of prov:Start provides additional descriptions about the binary prov:wasStartedBy relation from some started prov:Activity to an prov:Entity that started it. For example, :foot_race prov:wasStartedBy :bang; prov:qualified [ a prov:Usage; prov:entity :bang; :foo :bar; prov:atTime '2012-03-09T08:05:08-05:00'^^xsd:dateTime ]. Start by Activity is the start of an activity with an implicit trigger generated by another activity. An instance of prov:StartedByActivity provides additional descriptions about the binary prov:wasStartedByActivity relation from some started prov:Activity to another prov:Activity started it. For example, :second_leg_of_relay prov:wasStartedByActivity :handed_baton; prov:qualified [ a prov:Usage; prov:entity :handed_baton; :foo :bar; prov:atTime '2012-03-09T08:05:08-05:00'^^xsd:dateTime ]. Traceability is the ability to link back an entity to another by means of derivation or responsibility relations, possibly repeatedly traversed. An instance of prov:Trace provides additional descriptions about the binary prov:tracedTo relation from some prov:Entity to some other prov:Element. For example, :stomach_ache prov:tracedTo :spoon; prov:qualified [ a prov:Trace; prov:entity :spoon; :foo :bar ]. A usage is an instantaneous world event: an activity beginning to consume an entity. Before this event, the activity had not begun to consume or use to this entity. An instance of prov:Usage provides additional descriptions about the binary prov:used relation from some prov:Activity to an prov:Entity that it used. For example, :keynote prov:used :podium; prov:qualified [ a prov:Usage; prov:entity :podium; :foo :bar ]. The property used by an prov:ActivityInvolvement to cite the prov:Activity that was involved with either an Activity or Entity. It can be used to refer to the activity involved in generating an entity, informing another activity, or starting another activity. <http://dbpedia.org/resource/Amelia_Earhart>            a prov:Person, prov:Agent . The property used by a prov:AgentInvolvement to cite the Agent that was prov:involved with either an Activity or Entity. It can be used to express the agent involved in being responsible for an activity, being attributed to an entity, starting or ending an activity, or being responsible for another subordinate agent in an activity. The property used by an prov:EntityInvolvement to cite the Entity that was prov:involved with either an Activity or Entity. It can be used to refer to the entity involved in deriving another entity, being quoted or revised from, being the source of another entity, or being used in an activity. 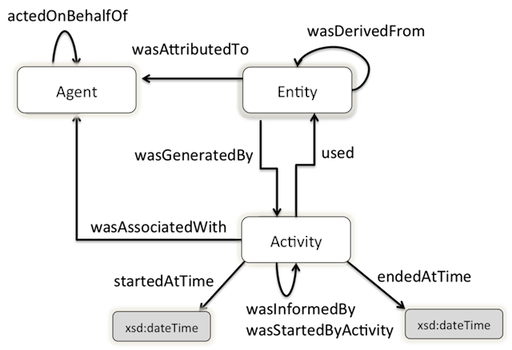 The activity generating the derived entity and using the derived-from entity. TODO: one of a few classes. The generation involving the generated entity and activity. The agent who attributed to the original entity. The agent who is doing the quoting. When an instance of prov:Involvement uses the prov:hadRole property to cite a prov:Role, it is providing a role for the instance referenced by the prov:entity or the prov:activity properties. For example, :baking prov:used :spoon; prov:qualified [ a prov:Usage; prov:entity :spoon; prov:hadRole roles:mixing_implement ]. The usage involving the used entity and activity. Subproperties of prov:involved may be be qualified by creating instances of a corresponding prov:Involvement class. For example, the binary relation :baking prov:used :spoon can be qualified by asserting :baking prov:qualified [ a prov:Usage; prov:entity :baking; :foo :bar ] prov:involved should not be used without also using one of its subproperties. Subproperties of prov:involved may also be asserted directly without being qualified. :houseStyles a prov:Plan, prov:Entity . If this Activity prov:wasInformedBy Activity :a, then it can qualify how it was Inform[ed] using prov:qualifiedInform [ a prov:Inform; prov:activity :a; :foo :bar ]. prov:hadRole :violator; # The chauffeur was the one violating traffic rules. prov:hadRole :enforcer; # The officer was the one enforcing the traffice rules. prov:hadRole :employer; # The celebrity employed the chauffeur during the enforcement. prov:hadRole :employer; # The city of Paris employed the chauffeur during the enforcement. prov:atTime          "2011-07-16T01:52:02Z"^^xsd:dateTime; # TODO: why different than above? If this Activity prov:wasStartedByActivity :a, then it can qualify how it was started using prov:qualifiedStart [ a prov:Start; prov:activity :a; :foo :bar ]. If this prov:wasAttributedTo Entity :e, then it can qualify how using prov:qualifiedTrace [ a prov:Trace; prov:entity :e; :foo :bar ]. If this prov:wasAttributedTo Activity :a, then it can qualify how using prov:qualifiedTrace [ a prov:Trace; prov:activity :a; :foo :bar ]. The terms used to describe the provenance of collections of key-value pairs are discussed in Section 3.4. A dictionary is an entity that provides a structure to some constituents, which are themselves entities. These constituents are said to be member of the dictionary. This concept allows for the provenance of the dictionary, but also of its constituents to be expressed. Such a notion of dictionary corresponds to a wide variety of concrete data structures, such as a maps or associative arrays. A given dictionary forms a given structure for its members. A different structure (obtained either by insertion or removal of members) constitutes a different dictionary. prov:DictionaryInvolvement provides descriptions of any binary involvement between any instance and a prov:Dictionary. Insertion is a derivation that transforms a dictionary into another, by insertion of one or more key-value pairs. A key-value pair. Part of a prov:Collection through prov:Membership. The key is any RDF Literal, the value is a prov:Entity. Described members of a collection, in the form of key-value pairs. The Membership resource can also be annotated with attributes. Removal is a derivation that transforms a dictionary into another, by removing one or more key-value pairs. The dictionary was derived from the other by insertion. prov:qualifiedInsertion shows details of the insertion, in particular the inserted key-value pairs. The dictionary was derived from the other by removal. prov:qualifiedRemoval shows details of the removal, in particular the removed key-value pairs. The property used by a prov:DictionaryInvolvement to cite the prov:Dictionary that was prov:involved in insertion or removal of elements of a collection. An object property to refer to the prov:KeyValuePair inserted into a prov:Collection. # prov:key is used to reference the key in a prov:KeyValuePair. The key of a KeyValuePair, which is an element of a prov:Collection. The key-value pair was part of the membership. A membership can have multiple members. The collection included the specified membership of keys-values. If this Dictionary prov:derivedByInsertionFrom another Dictionary :e, then it can qualify how it did perform the Insertion using prov:qualifiedInsertion [ a prov:Insertion; prov:dictionary :e; prov:inserted [a prov:KeyValuePair; prov:key "k1"^^xsd:string; prov:value :foo] ]. If this Dictionary prov:derivedByRemovalFrom another Dictionary :e, then it can qualify how it did perform the Removal using prov:qualifiedRemoval [ a prov:Removal; prov:dictionary :c; prov:removed "k1"^^xsd:string ]. The key removed in a Removal. # prov:value is used to reference the entity in a prov:KeyValuePair. # The object of a prov:value statement is inferred to be of type prov:Entity . # The subject of a prov:value statement is inferred to be of type prov:KeyValuePair. The value of a KeyValuePair.